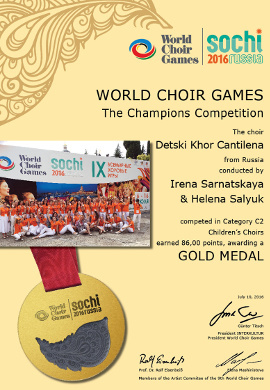 The Cantilena Children’s Choir (Detski Khor Cantilena, Moscow) was founded by Irena Sarnatskaya in 1967. From the 21st to the 23d of November 2017 the final stage of the All-Russian Choral Festival was held in Moscow. The Children’s Choir “Cantilena” became the winner, the choir was given a diploma of the Laureate of the 1st degree in the category D2 (children’s choirs) and also the choir was a participant of the Gala concert of the finalists of the All-Russian Choral Festival. Sergei Sobyanin awarded grants to the best students of the capital’s schools and colleges of creative work on the 3d of November 2017. The ceremony took place in the Moscow International House of Music. The Children’s Choir “Cantilena” became the laureate of the I degree in the contest “Grants of the Mayor of Moscow in culture and art“. 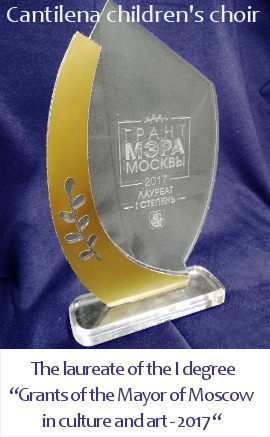 The main prize of the competition – Grand Prix “For outstanding contribution to the education of creative young people” – was given to the Children’s Art School named after S.Dyagilev. Congratulations to the teachers and students of our school! Keep it up!!! The concert “Italian Music of the Baroque” took place in the Theatre Hall of the CC «Zelenograd» on the 27th of October. Participants: the chamber orchestra under management of Freddy Cadena (an Ecuadorian conductor, a resident of Russia), the soloists of the Novaya Opera Theatre – O. Ionova (soprano) and N. Creslin (mezzo-soprano), the Honoured Artist of Russian Federation O. Tomilova (oboe), the laureate of international competitions O. Yakubovich (oboe), V. Sergeeva (flute), the laureate of international competitions I.Sitnikova (cello) and the Children’s Choir “Cantilena”. A concert “Wreath to the Teacher” dedicated to the 80th anniversary of Elena Gladilina’s birth (a professor at the Moscow Conservatory 1937-2003) was held in the Rachmaninov Hall of the Moscow State Tchaikovsky Conservatory on the 4th of October 2017. Participants of the concerts were the students E.V. Gladilina: A.Vetlugina, M.Voinova, E.Panikova, O.Filippova and others. There was also the premiere of A.Vetlugina’s work “Lux aeterna” which was performed by the Children’s Choir “Cantilena”. The Сhildren’s Сhoir “Сantilena” became the laureate of the 1st stage of the district stage of the All-Russian Choral Festival, which was held in Podolsk on the 24th of September 2017. Congratulations! To the 50th anniversary of the Сhildren’s Сhoir “Cantilena”! The Jubilee Concert of the Children’s Choir “Cantilena” was held in the Theatre Hall of the Cultural Center “Zelenograd” on the 22nd of April 2017. The “Cantilena” choir received the First Class Diploma, the special prize of the Jury “For outstanding achievements in choral art” and the special prize of the Jury “For the best performance of sacred music” at the IV Junior Choral World Championship, which was held in St. Petersburg on the 22-26th of February 2017. On the 14th of January 2017 the “Cantilena” choir took part in the concert “Christmas Oratorio”, which took place in the Moscow Crocus City Hall. The music of Metropolitan Hilarion (Alfeev) was performed by a symphony orchestra, children’s and adults’ choirs and famous opera singers. 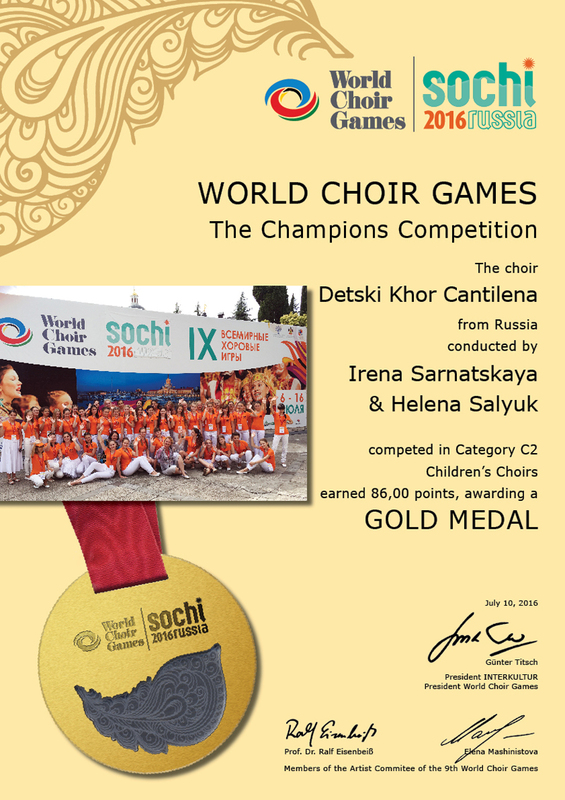 2016 Russia, Sochi: 9 the World Choir Games (“The Golden Medal” category Champions Competition – Children’s Choirs). 2015 Russia, Moscow: All-Russian Choral Festival (the second prize winner). 1989 Bulgaria (Gabrovo); 1996 Denmark (Copenhagen); 1999 The USA, New York, Washington (concerts in the Capitol, “The White House”); 2001 Slovakia, Austria, Poland; 2004 France, (Paris); 2006 Germany (Munich); 2011 The Netherlands (Amsterdam). Since 1990 Choir acquired Helen Saliuk as the second director. The Church Works’ Hall of the Church of Jesus Christ. Directors: Irena Sarnatskaya, Helena Saliuk. Piano accompaniment Anna Avetisyan. Feel free to send us any inquiries that you might have.